There are so many ways, big and small, for you to resist mining injustice and/or support the work of the Mining Injustice Solidarity Network. Here are some, just to get you started. MISN is always looking for new people to join us. Do you have a campaign idea? Want to hear about Toronto events related to mining? There is a type of involvement to match many different interests, capacities and levels of time commitment. Whether you enjoy doing artistic interventions, protesting mining companies, research and writing, providing food or child care support, or organizing public awareness events, there is a role for you in MISN. If MISN is not currently doing the kind of work you’re interested in, the group could support your initiative! First, sign up for our low-traffic newsletter here. There are three main types of involvement in MISN: core members, volunteers and supporters. Organize with MISN’s core group of members! MISN is a grassroots group that organizes entirely on a volunteer basis. The huge array of events, campaigns, and actions we organize year-round depends on a team of organizers (like you!) to bring it all together. This means that, in order to be effective in holding mining companies operating at home and abroad accountable, we need your skills, knowledge, and energy! Core members organize MISN events, campaigns and materials while also planning the larger direction of the group. They meet about two or three times a month. Meetings are usually held weekday evenings and Sunday afternoons in wheelchair accessible public locations, but also sometimes at members’ homes. * Members are also part of smaller sub-committees planning specific actions, or representing MISN as part of other networks (e.g. 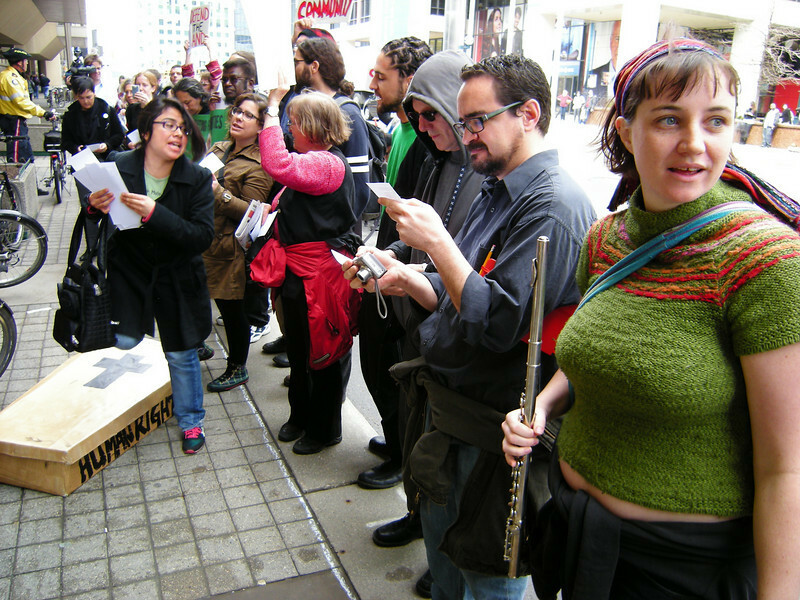 Latin American and Caribbean Solidarity Network, Canadian Network for Corporate Accountability, May Day planning etc.). While there are activities year-round, the busiest time tends to be prior to and during shareholder season (“Spring into Action”) from April to June. While it’s expected that members follow through on commitments and keep informed, everyone understandably has different capacities at different times and are encouraged to contribute what works for them individually. You don’t have to be an expert on mining issues to join MISN! We do ask, however, that you be open to learning and working within an anti-oppressive framework. Core members are part of the internal higher volume list-serve. New members are added onto this list-serve, if interested, after attending several meetings and getting involved in the group. MISN is always open to welcoming new people into our working collective. If you are unable to attend an orientation (or there isn’t one happening anytime soon) but are interested in getting involved, please email us at mininginjustice [at] gmail [dot] com – if this is the case for a number of people we’ll try to schedule another orientation soon. *Please let us know how meetings and events could be made more accessible for you. Join our group of ad hoc volunteers! Volunteers are MISN Supporters (see below) but are also on a special volunteer newsletter. * MISN calls on this small group of amazing people to provide help at specific events when they are able. Examples of volunteer activities include – making banners (aka art builds), setting up for events, taking on roles in creative actions, greeting attendees, etc. If you’re a volunteer and haven’t heard from us in a while, get in touch! We sometimes forget to draw on the talents and resources of our wonderful volunteers. *You can join this list by signing up at events or by emailing mininginjustice at gmail dot com with “Volunteer” in the subject line. Are you getting updates from MISN? Hundreds of supporters get news from MISN’s low volume newsletter (sign up on the right-hand sidebar of this page), on Twitter, and from our Facebook page. They make MISN activities a success by sharing posts and event notices with their networks. They attend MISN events, whether protests, vigils, public speakers, or film screenings, as they are able. Some make financial contributions to help MISN, an all-volunteer group, function. Everything you do to raise awareness of mining injustices and to challenge the Canadian mining industry is important.